Tourism organisations from across the island of Ireland took part in a tourism trade mission to China last week. The four-day trade mission, organised by Tourism Ireland’s China office, took in the cities of Shanghai and Beijing and involved a series of B2B workshops, networking events and media interviews for the participating Irish companies. 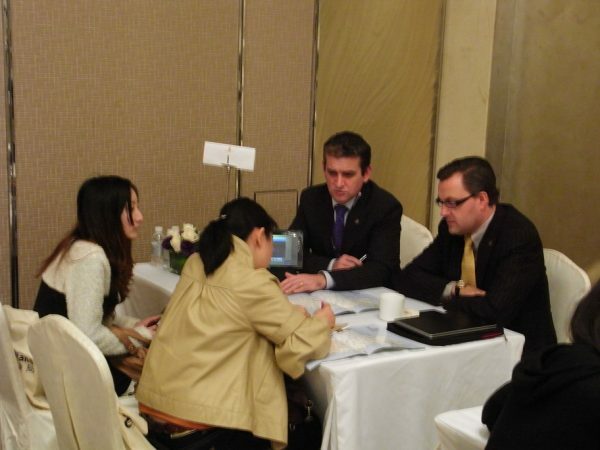 Peter Loughnane, County Arms Hotel, Birr (left), and Patrick Parsons, Birr Castle, with Chinese travel agents during a B2B workshop in Shanghai. Over the four days, face-to-face meetings were conducted with more than 60 Chinese decision-makers – including leading travel agents and tour operators – to encourage them to include Ireland in their future holiday programmes and to recommend it as a destination of choice for their clients. The trade mission provided a very useful platform for the participating tourism companies from Ireland to showcase their product to the travel agents, who collectively produce more than 80% of Ireland’s tourism business from China. During their time in Shanghai and Beijing, the Irish companies were also interviewed by a number of influential Chinese travel writers. Commenting on the longer-term potential of new and developing markets such as China for tourism to the island of Ireland, Susan Li, Tourism Ireland China, said: “The majority of Ireland’s overseas visitors are from the core markets of Great Britain, Mainland Europe and North America, and while this will continue, it is important that we expand our focus beyond these markets and look to the long-term opportunities presented by emerging tourism markets in Asia like China. The World Tourism Organisation forecasts that the Asia-Pacific region will be one of the fastest growing outbound regions for travel, expanding by +6.5% on average over the next 15 years. Trade missions such as this provide a good opportunity for our Irish partners to develop their business links and enhance their relationships with key decision-makers, helping to grow their tourism business from China.